DVD Review: Longmire: Season 3 – Still The Best Mystery Series On TV! Despite having great ratings, Longmire was canceled by A&E after its third season, leaving fans with (if nothing else) an emotional cliffhanger and a lot of questions. With a fourth season being picked up by Netflix, millions of fans breathed a sigh of relief. Now Warner Home video has released the show’s third season DVD and fans can binge their way through the ten episodes again (which is likely how they’ll watch season four if they’re anything like me…). Despite being light on bonus features (a single featurette), the DVD is worth having because the show is one of the great mystery series. 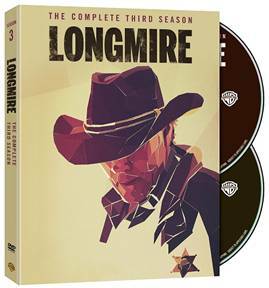 Longmire: The Complete Third Season Coming In March! The third season of Longmire – to my mind at least – the best mystery series on television right now, comes to home video on March 3, 2015. Longmire: The Complete Third Season will include all ten episodes (including that major cliffhanger of a finale) plus a new featurette: The Ghost In The Storm. For further details, follow the jump.